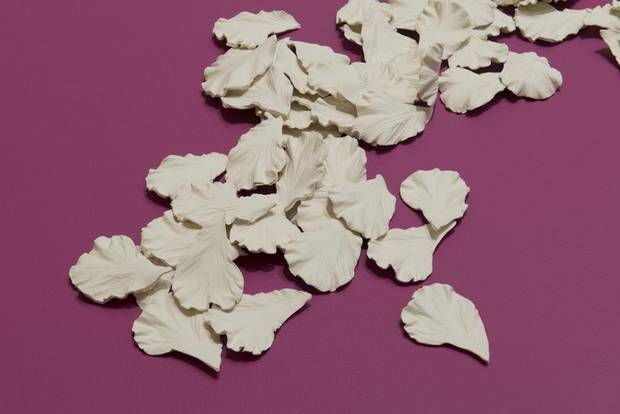 Studies for gardens, an installation piece done by Erika DeFreitas, is part of Migrating the Margins, an art exhibition that celebrates young artists from Toronto’s suburbs, at the Art Gallery of York University. I n the neighbourhoods where Rajni Perera was raised, every home owned two or three drying racks, she recalls. You could find them littering backyards and balconies – the wooden doweled horses or the collapsible wire kind. "It's because we didn't have money to buy an electric dryer," explains the Sri Lankan-born artist, who grew up in Scarborough and North York. Not particular to any one immigrant community, ethnic group or culture, the racks, in her mind, are symbols of the place she comes from: Toronto's suburbs. In the back room at the Art Gallery of York University (AGYU), Perera has turned that mundane domestic chattel into the fantastical, welding a series of racks together to become a 16-foot-tall mech warrior (modelled specifically after the Spartas Veritech Hover Tank from her childhood favourite, the Robotech animated TV series). Drapes, a table runner, an old T-shirt – the laundry – become instead like armour. When, as she notes,"sci-fi is primarily a white guy's world," her exploration of black and brown female science fiction is about wanting to see her and her friends reflected in a place she's always loved but felt excluded from. "It isn't just a genre, it's a window," she says. "It shows you possibilities. And when you're not included, that window isn't open for you." Within Perera's visual universe, it is the diasporic body that's presented as the body of the future. Within Rajni Perera’s visual universe, it is the diasporic body that’s presented as the body of the future. 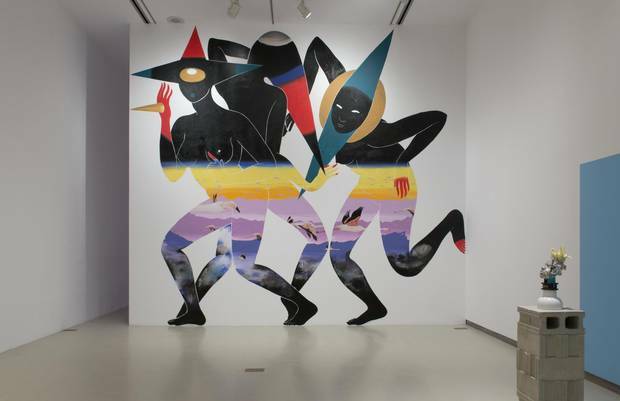 Her work, including a showstopper of a wall mural, appears as part of the group exhibition Migrating The Margins, a celebration of young artists from Toronto's suburbs. For the past 14 years, the AGYU has cheekily responded to the common downtown refrain "all the way out there?" by creating a vision defined by its off-centre locale. Being "out there," explains co-curators Philip Monk and Emelie Chhangur, means serving the local community first, it means an institution unbeholden to the practices and expectations of the downtown art crowd and it means embracing its suburban context as an identity. Just as the Toronto-York Spadina Subway Extension readies to open, connecting neighbourhoods northwest of Downsview with the core, the curators have identified what they call "a rupture moment." More than ever, cultural producers hail from outside of downtown – from Rexdale or Brampton or Jane and Finch – and also from outside the traditions of the European avant-garde inherited by downtown cultural gatekeepers. Cultural authority is being diffused, Chhangur observes. "No longer a monolith, now more a constellation." The city's suburbs, the curatorial essay argues, are something like the dreams of the Canadian Multiculturalism Act in the process of realization. Not the separate but equal identities the Act seems to provision (the bureaucrats got that part twisted, Monk says), but instead, a growing, continually interweaving hybridity of cultures. Migrating The Margins begins to document the coming of age of a wave of second-generation Canadians, third-culture kids and other suburban artists, creating expressions and inquiries from perspectives unique to the GTA. Chhangur and Monk call it "the future of Toronto art." It's perhaps also a bit of course setting for Monk, the recent Governor General's Award winner, before he retires at the end of the year. SHE in Light Form, No Pigs in Paradise and SHE in Shadow Form, No Pigs in Paradise is a collaboration between Nep Sidhu and Nicholas Galanin. The exhibition isn't a survey or some monographic study. There is no overarching theme, the curators point out. 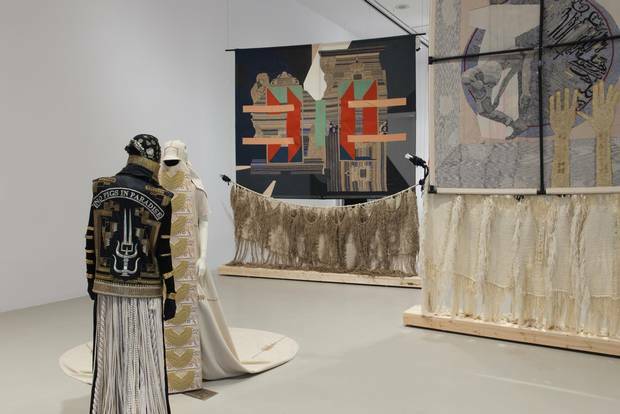 Rather, the show follows its five artists – and three others (two artists groups and one individual artist) – across their various investigations of place and belonging into reflections, for example, on the erasure of black Canadian narratives, the history of settler colonialism and justice for migrant workers. The first artworks visitors encounter are a collaboration between Nep Sidhu and Tlingit/Unanga artist Nicholas Galanin. SHE in Light Form, No Pigs in Paradise and SHE in Shadow Form, No Pigs in Paradise are two sculptural figures, posed opposite each other as if balancing the room, costumed and adorned with emblems traditional of Sikh and First Nations cultures. An exercise in communion and the belief that a better understanding of the feminine might repair disharmonies, the artists call the project a union between their cultures. DeFreitas’s work explores how the flower and garden become symbols of identity that bear the stories of migration and movement. 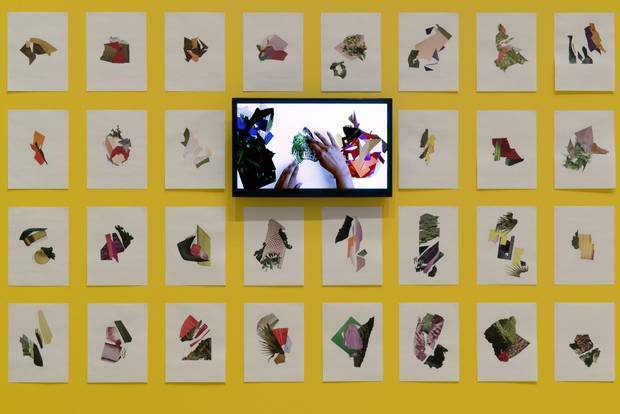 In the next gallery, Erika DeFreitas presents a wall of collages, arranged neatly into typological display, called Studies for gardens (a mixture between concept and discipline). This past summer, she participated in a residency at Alice Yard in Port of Spain, Trinidad, where she spent time at the University of the West Indies' herbarium, researching the island's flora. "What I discovered while doing this research," DeFreitas explains in an e-mail interview, "is that many of the trees, plants, and flowers (mango trees, for example) are not indigenous to the island but were, perhaps 'transplanted' is a good word to use, during colonization. In addition, a lot of the splicing of these plants happened there, meaning many are hybridized." The flower and garden thus become symbols of identity that bear also the stories of migration and movement. When many an institution strains to foster cosmopolitanism, perhaps the best an art gallery can do in the service of Canadian art – what Migrating The Margins endeavours to do – is take stock of what's growing in its own backyard.